Bluehost.com is currently running their fall cheap web hosting special for $3.95/month. Act now and get cheap web hosting at their fall discount rate! Bluehost has been providing cheap web hosting solutions to thousands of businesses and individual websites since 1996. Like they advertised on their website, Bluehost offers professional, cheap web hosting, with unlimited features starting only for $6.95/mo. While this is already a great price for cheap web hosting, they’re currently running their Fall promotion which allows you to have cheap web hosting for only $3.95 per month. A similar special is what initially convinced me to transfer my sites to Bluehost and I’ve been a happy customer since I made the transition. For full disclosure I am currently a Bluehost customer and have been since 2008. Having said that, there’s a reason I’ve used Bluehost for both myself and my clients for as long as I have: cheap web hosting that delivers. Bluehost is widely recognized by many host review sites to be an excellent cheap web hosting solution. They’re featured on Alreadyhosting.com, WebHost4Life.com, and many others. My personal experience has been that it’s an excellent cheap web hosting provider for personal sites, blogs, and small business sites. Bluehost is a SHARED hosting environment so if you suddenly see a huge spike in traffic your first inclination man be to move to a VPS. I thought the same once this site started receiving a lot of traffic. However, in addition to their cheap web hosting for $3.95 they also offer a “Pro” account. The Pro account transition is virtually seamless and I’ve yet to outgrow it (keep in mind that I not only run Paulspoerry.com on this account but several other sites for clients of mine. Checkout CodeMyOwnRoad’s write up on his move to the pro service, it mirrors my own experience. I heavily tweak my sites for performance, so while the shot below isn’t solely due to Bluehost is should give you an idea about how sites can perform on Bluehost’s cheap web hosting platform. I’ve written in the past about how a more responsive website will keep them more engaged and focused on your content. The results of simply moving to a new theme drastically improved my site’s performance. All of that was done on the cheap web hosting provided by Bluehost. In the future I’ll be writing articles on how to optimize your site by choosing the right theme, utilizing services such as Cloudflare (which works perfectly with Bluehost), caching plugins (W3 Total Cache works great on Bluehost), my experience of moving to Bluehosts Pro plan, and other tips to make your site fly. 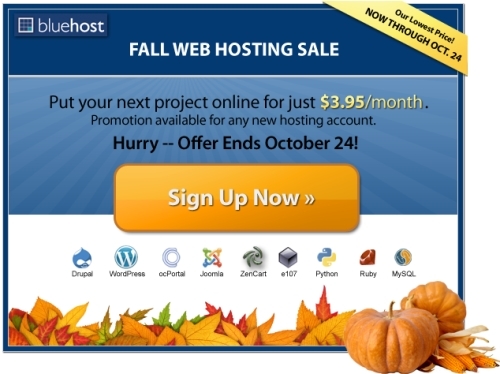 Get cheap web hosting for $3.96 with Bluehost!